Mercedes-Benz is to launch a new Uber-rivalling ride sharing service in Europe, kicking off with London. 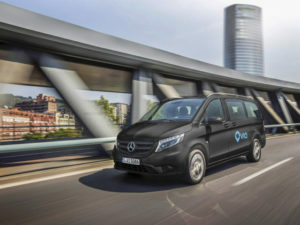 The joint venture with US technology start-up Via – which already operates ride sharing schemes in Chicago, New York and Washington – will offer on-demand shuttle services using the Mercedes-Benz nine-seater Vito Tourer and the eight-seater V-Class, which replaced the Viano MPV in 2015 integrated with Via’s software with on-board vehicle sensors. In the longer term, the cooperation will look to deploy electric vehicles and autonomous driving capabilities. The Via technology will enable passengers to hail a ride using an app and will match them up with passengers headed in the same direction. The joint venture – headquartered in Amsterdam – will also license the Via ride sharing technology to third parties, such as transport service providers and local public transit operators.For more latest industry news, click here.